8 februari 2017: Bron: ASH 2016 San Diego. Wanneer zwaar voorbehandelde patienten met vergevorderde botkanker - multiple myeloma (Kahler) een combinatie behandeling krijgen van Nelfinavir plus bortezomib en dexamethasone dan bereikte 65% van de deelnemende patienten (22 uit 34 patienten) alnsog een gedeelteljike remissie van 50 procent of meer. De algemene kliniche respons, waarin ook stabiele ziekte en minimale remissies werden meegenomen was maar liefst 86 procent. Het antiretrovirale medicijn nelfinavir toont sterke klinische activiteit bij zwaarvoorbehandelde patienten met resistente teruggekeerde multiple myeloma (Kahler) volgens een kleine fase II studie met 34 patienten. De response was 65%, inclusief een 15% zeer goede gedeelteljike remissie, van 50% of meer. Bij patiënten met een hoog risico met zogenaamde "cytogenetics", was de response 77%. De verdere ontwikkeling van dit medicijn met veel potentie is echter onzeker omdat het patent op nelfinavir afloopt. Positieve klinische reacties werd gezien bij 22 patiënten uit 34 (= 65%) die de nelfinavir plus behandeling kregen. Er werden zeer goede remissies gezien (tussen de 50 en 100 procent) bij 5 patienten (15%) en gedeeltelijke remissies (een PR van gelijk of meer dan 50%) bij 17 patiënten (50%). 3 patiënten (9%) had een remissie kleiner dan 50% en 4 anderen (12%) hadden stabiele ziekte, dus stopte de progressie van de ziekte, resulterend in een klinische respons van 86%. Klinische effectiviteit werd algemeen gezien bij alle patienten ongeacht de verschillende voorbehandelingen van bv. stamceltransplantatie of chemo of andere behandelingen. behalve dan het abstract zoals dat op de ASH werd gepresenteerd. Maar bedenk dat alle patienten minimaal 5 andere behandeliingen eerder hebben gehad en dan toch nog zo goed reageerden op deze behandeling is natuurlijk heel goed nieuws. Nelfinavir in combination with bortezomib and dexamethasone (NVd) is a reasonable, active, safe and widely available treatment option for patients with proteasome inhibitor-refractory multiple myeloma. The objective response rate of 65% observed in this very advanced, heavily pretreated, mostly dual-refractory patient population is exceptional. Our results warrant further development of nelfinavir as a sensitizing drug for proteasome inhibitor-based treatments and promising new agent for MM therapy. Rationale: Proteasome inhibitor-refractory multiple myeloma (MM) patients are a difficult to treat population with a very poor prognosis. The activity of registered, current or next generation MM drugs (pomalidomide, carfilzomib, daratumumab) in heavily pretreated, proteasome inhibitor-refractory MM is in the range of 30%. The biology of proteasome inhibitor resistance is driven by adaptive downregulation of the unfolded protein response (UPR), which regulates plasma cell maturation and sensitivity to proteasome inhibitor treatment (Leung-Hagesteijn C. et al., Cancer Cell 2013 Sep 9;24(3):289-304). 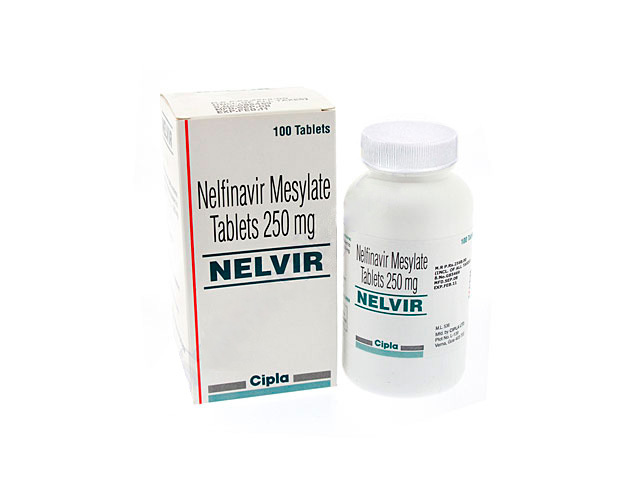 The oral HIV protease inhibitor nelfinavir (NFV) has anti-MM activity in vivo, triggers UPR activation, sensitizes MM to proteasome inhibitors and overcomes proteasome inhibitor resistance in vitro. Combination therapy with NFV and bortezomib (BTZ) showed UPR activation in vivo and strong signals of activity in bortezomib-refractory MM in the SAKK 65/08 phase I trial (Driessen C. et al., Haematologica 2016 Mar;101(3):346-55). Objective: We performed a prospective, multicenter phase II trial to assess the activity of nelfinavir, bortezomib and dexamethasone (NVd) in proteasome inhibitor-refractory MM. Methods: Patients with progressing, measurable, proteasome inhibitor-refractory MM (IMWG criteria) were included in this multicenter phase II trial. Further selection criteria included WHO performance status ≤ 3, platelets ≥ 50 x 109/L, hemoglobin ≥ 80 g/L (both may be achieved by transfusion) and adequate hepatic function. Concomitant use of other anti-cancer medication or radiotherapy, except for local pain control, was excluded. Patient age or prior number or types of therapy were not limited. Simon’s two stage design was used to differentiate a promising activity (best response at any time point, partial response (PR) or better, ≥ 35 %) from an uninteresting activity (≤ 15% PR; power 80%, alpha 5%). Results: 34 patients were treated with oral nelfinavir 2500 mg days 1-14 b.i.d. in combination with bortezomib + dexamethasone (BTZ 1.3 mg/m2 days 1, 4, 8, 11, dexamethasone 20 mg p.o. days 1-2, 4-5, 8-9, 11-12) for a maximum of 6 21-day cycles at 9 SAKK trial sites throughout Switzerland. Patients (median age 67.5 years, range 42-82 years) had a median of 5 (range 2-12) prior therapy lines, 26 (76%) patients had prior high dose chemotherapy, and 13 (39%) had known poor prognosis cytogenetic abnormalities. All treated patients had proteasome inhibitor refractory MM according to IMWG criteria, i.e. they had progressed during or within 60 days after adequately dosed proteasome inhibitor-containing therapy. Moreover, 26 (76%) patients were lenalidomide-refractory by IMWG criteria (double refractory). Trial therapy is still ongoing in 2 patients. The median number of treatment cycles delivered per patient is 4. 22 patients achieved an objective response with a PR or better, resulting in an overall response rate (OR) of 65% (90% CI 49.2%-75.7%) to date. VGPR was reached in 5 patients, PR in 17 patients, MR in 3 patients, SD in 4 patients and PD in 3. 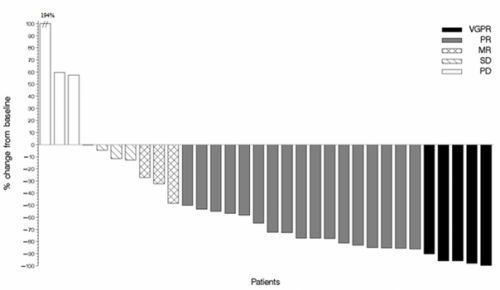 In patients double-refractory for proteasome inhibitors and lenalidomide, the OR was 69%, in patients with poor prognosis cytogenetic abnormalities it was 77%. The OR was independent from the number of prior therapy lines (OR rate 69% with < 5 prior therapy lines, OR rate 61% with ≥ 5 prior lines). Most frequent > grade (G) 2 adverse events to date were anemia (G3 29%), thrombocytopenia (G3 24%, G4 18%), infections (G3 24%, G4 9%, G5 3%), hyperglycemia (G3 18%, G4 3%) and fatigue (G3 12%). Six patients maintained their PR or better for the full 6 cycles per protocol while on study. Four patients continued NVd therapy on a compassionate use basis after completing the study. Updated final data will be provided at the meeting. Conclusion: Nelfinavir in combination with bortezomib and dexamethasone (NVd) is a reasonable, active, safe and widely available treatment option for patients with proteasome inhibitor-refractory multiple myeloma. The objective response rate of 65% observed in this very advanced, heavily pretreated, mostly dual-refractory patient population is exceptional. Our results warrant further development of nelfinavir as a sensitizing drug for proteasome inhibitor-based treatments and promising new agent for MM therapy. Figure 1. Maximum relative change in serum M-protein or serum free light chain concentration in individual evaluable patients. Disclosures: Driessen: Mundipharma-EDO: Honoraria, Membership on an entity's Board of Directors or advisory committees; celgene: Consultancy; janssen: Consultancy. Samaras: Celgene (Adboard, educational talk), Amgen (adboard), Takeda (Adboard), Roche (Adboard), Sanofi (Adboard), Novartis (Adboard): Consultancy, Honoraria. Zander: Bristol Myers, Celgene, Amgen, Mundipharma, Janssen-Cilag, Takeda Pharma: Consultancy, Membership on an entity's Board of Directors or advisory committees. Reageer op "Nelfinavir, een HIV remmer, plus bortezomib (velcade) geeft uitstekende resultaten - 65 procent bereikte PR - bij zwaar voorbehandelde patienten met vergevorderde multiple myeloma, Kahler"